Online shopping is definitely one of my guilty pleasures (as you can see on the picture above…). All warm and cozy in my sweats on the couch. Add a cup of tea and then, the endless scrolling through the wide range of the worldwide webshops can begin. There’s no better way to skip lines, to avoid crowded areas and to pass sweaty fitting rooms. What’s not to love? Do you recognize the following situation? You’ve set your heart on a super cute pair of shoes. You want them extremely bad, but you don’t want your money to be suddenly all gone. That’s when I transform into a real bargain hunter. I’ll pursue the shoes until I’ve found the best deal. This mindset might be typical Dutch (it so happens that Dutch people are known to be kind of stingy), but why would you pay more for something when you don’t have to? eBay is one of the places where I, once in a while, get my hands on an unexpected great deal. For example, I chanced upon Clarks Desert Boots brand new including the original box, an original KENZO phone case and a Collection concealer that was sold out in all physical stores. Over the years I’ve become more skillful at finding great deals (especially on eBay). 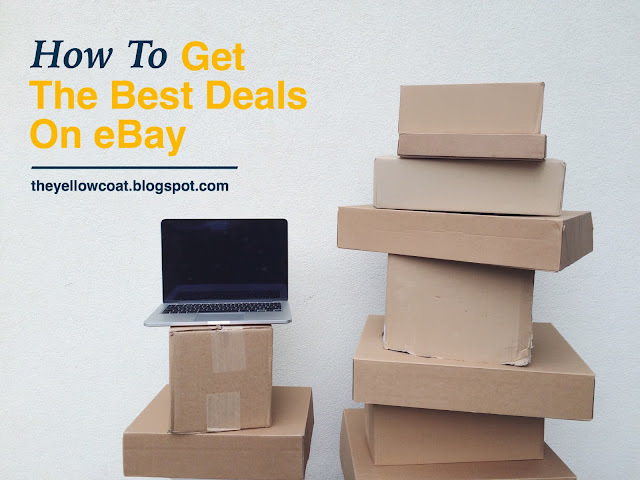 Therefore, I thought it would be nice to share my 5 steps on how to get the best deals on eBay. Have fun reading and embrace your inner Dutchie! A good beginning is half the battle, as the saying goes. And I have to agree. As you might know, eBay has an enormous amount to offer, including a lot of trash. By adding many keywords to the search bar, you’ll immediately filter the ads that suit your wishes best. You can also filter on colour, condition etc. In this way, you don’t have to search endlessly for ads that might be interesting for you. That will save you a lot of time! Shipping costs are generally something we would rather not spend our money on. Especially if you buy something from a seller who is a resident of the other side of the ocean, with the result that this kind of costs can increase quickly. Fortunately, some eBay sellers have already passed on the shipping costs in their price. So therefore we don’t have to pay anything extra. The above-mentioned step is unfortunately not always available. Does this apply to your search? Don’t worry. By arranging the ads in Price + Shipping: lowest first you can still make sure that the price you’ll pay eventually, is as low as possible. Please note that some sellers also charge import costs. These costs are separate from the delivery costs and therefore are not calculated in this filter. My tip: try to find a seller who doesn’t charge import costs at all, because this costs are high and unnecessary and there are mostly enough sellers who don’t charge this extra costs. Many people forget to do this. But if you’ve found an ad which looks quite good at first sight, there is much more information to gather about the item apart from a good-looking picture and the price. If you scroll down, you’ll see the item specifics. This will give you information about the condition of the item, for example if it’s delivered with the original box and tags. Pretty handy, if you ask me! So now that you’ve chosen an ad that matches your wishes, you want to ensure that the seller from whom you are buying the item is reliable. Therefore you can check the seller information. You’ll see exactly the areas previous buyers were contented about and what were still (if applicable) areas for improvement. Based on this information you can determine for yourself whether it is sensible to buy something from a particular seller. For me, this information can make or break the deal. So, this are my 5 steps to get the best deals on eBay. I hope that this article might have been helpful to you. And I would say, shop wisely! Are you an online-shopping maniac? Your post is very helpful, I have never bought anything on ebay yet, but maybe I'll try now with your advises!